Remember perl? The “scripting language” that was the one of the first that many of us used on UNIX to automate system administration tasks? And then was later used in the 1990s for a ton of web CGI programming and so much more? And that we could have so much fun with created “obfuscated” programs that looked like gobbledegook but actually did something useful? The slide set from Jesse Vincent embedded in the RWW article is interesting in that it does show the good amount of work being done by the perl faithful to bring more stability and progress to the perl language. I commend them all for the work… it looks like really good things are happening. Is it enough to make me personally return to working with perl? Probably not, to be honest… but for the sake of all those people who still work with perl… and for people looking for a great multi-purpose programming language with deep roots and a huge base of documentation and usage… it’s good to see the language evolving again! This entry was posted in Programming and tagged Languages, perl, Programming on October 9, 2011 by Dan York. This is across 600,000+ developers and close to 1.8 million git repositories. 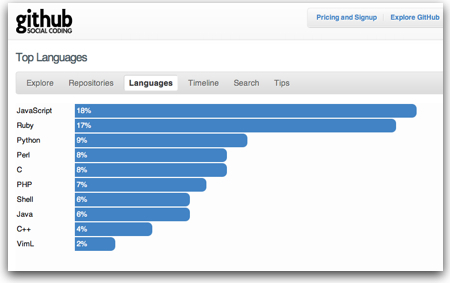 Like any measurement this can only be taken as language popularity within the Github community. Measurement within another community would give different results. Still, the Github space is very vibrant and dynamic with lots of energy… it’s interesting to see what folks there are using. This entry was posted in Github, Podcasts and tagged Github, Languages on February 27, 2011 by Dan York. This server has received 5726809 hits from both ipv4 and ipv6.